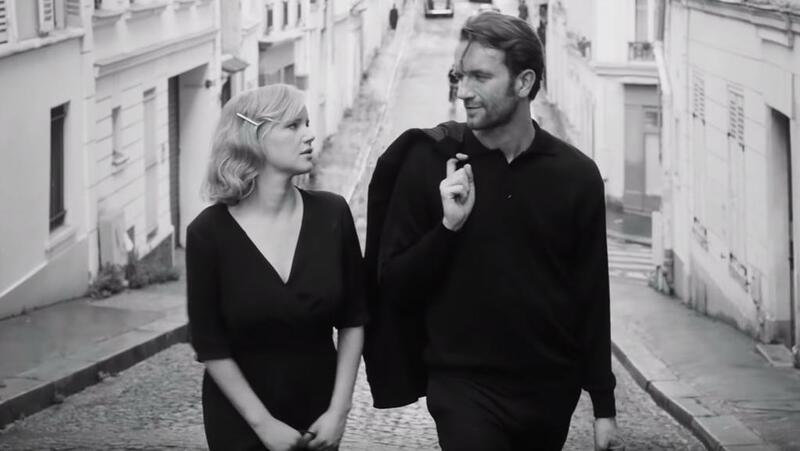 Cold War is one of those black-and-white films that you cannot imagine in color, so austere is the world the characters inhabit. It begins in the Polish countryside in 1949, a desolate landscape of postwar rubble. But even when the setting changes years later, to a go-go Paris of jazz clubs, lavish soirées and bartop dancing, the stark photography still seems appropriate. That’s because its central couple, whether together or apart, separated by politics and fear or connected by creativity and pheromones, is inherently self-destructive, creating a color-bleached world of passionate extremes. For Wiktor Warski (Tomasz Kot, Poland’s answer to Gregory Peck in his rugged prime), the musical director of a dance company, he’s doomed the moment he lays eyes on Zula Lichon (Joanna Kulig), a peasant girl who shows up at an audition without a song, and proceeds to steal another girl’s, outshining her with an implacable charisma. Wiktor and Zula strike up an affair, but the climate of Stalinist Communism — which infiltrates Wiktor’s programming, and which he wants no part in — leads him toward an exile that Zula, in fact, helps to expedite. For the next 10 years, they meet in European haunts — under cover of night, away from the prying eyes of authorities, often neglecting their irrelevant spouses — and even move in together, until Zula’s mercurial whims and gypsy drift force another separation, which leads, just as inevitably, to her return to his arms, both characters more broken than before. Set to an immaculate soundtrack of Eastern European folksongs and Western pop and rock, director Pawel Pawlikowski’s (Ida) elliptical masterpiece is a chilling exploration of addiction, the vice in question being love itself, pursued to each character’s mutual detriment. Playing out as it does over a decade and a continent, Wiktor and Zula’s relationship is a Band-Aid removed, ever so deliberately, over an existential wound neither can heal. Along the way, the pendulum of creative success and decline continues its exorable motion. Zula becomes a chanteuse with a record contract while Wiktor’s career fades from symphony conductor to jazz sideman and B-movie composer. It’s like Pawlikowski took A Star is Born, stitched it into Phantom Thread and threw his doomed romance into the muddy waters of ’50s film noir. Formally rigorous and psychologically astute, it’s one of the season’s top films, well deserving of the Oscar nominations bestowed on it this week — not just for Best Foreign Language Film, which was expected, but for Best Director and Best Cinematography. COLD WAR. Director: Pawel Pawlikowski; Cast: Tomasz Kot, Joanna Kulig, Borys Szyc; Distributor: Kino; Rated R; in Polish, German, French, Russian, Italian and Croatian, with English subtitles. Now playing at Coral Gables Art Cinema; opens Jan. 25 at Living Room Theaters in Boca Raton, Movies of Delray in Delray Beach, and O Cinema in Miami.